The Ultimate Chocolate Baking Challenge - Can You Rise To The Challenge? Have you been watching The Great British Bake Off? I admit, it's one of my guilty pleasures... 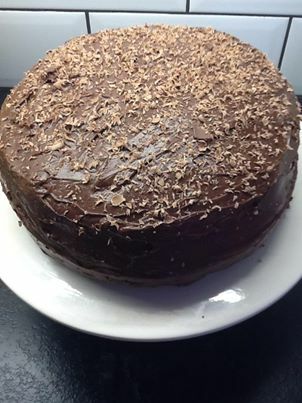 I love cooking but never seem to have the time these days, and one of my resolutions is to have more time to bake this year. There is something utterly satisfying about creating and baking something delicious for friends and family. So when I saw this competition run in conjunction with The Great British Bake Off and Elizabeth Shaw I thought it would be of interest to my readers too. 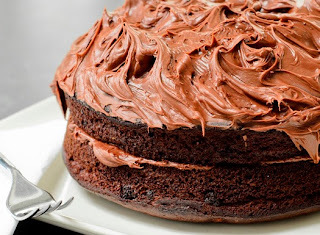 How many of us would love to be on TV where your baking skills speak for themselves. Or get excited watching Jamie, Heston or Nigella perform their skills in the kitchen. Well, now is your chance to be involved in a chocolate baking competition with some fantastic prizes available. Classic chocolate brand Elizabeth Shaw are inviting everyone to submit their chocolate baking recipe to its website to be in with the chance of winning a meet and greet with The Great British Bake Off judges, Paul Hollywood & Mary themselves and have your recipe featured live on The Great British Bake Off Stage at the BBC Good Food Show Winter. 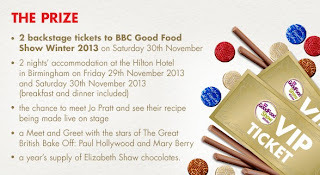 Elizabeth Shaw has teamed up with the team at the BBC Good Food Show Winter, 27 November - 1 December and as a result is hosting its very own ‘Chocolate Baking Challenge’. From the five finalists, one winner will be chosen on the day and will win a prize that money can’t buy! There are also a number of runners up prizes including a year's supply of chocolate. Thanks for sharing! WOW that cake looks soooooo nice!